The road to he!! is paved with good intentions. That’s what my grandmother used to tell me now and then. Perhaps it was a hint. Basically, it means that individuals may do bad things even though they intend the results to be good. I look back and think, maybe I was a little bit of a wild card then. I sure hope so. I really haven’t sowed any wild oats in the last 30 years or so—unless you count this Irish Whiskey Bread Pudding. This luscious, slightly chewy, thick and creamy bread pudding is taken to the next level of goodness or badness…depending on how you look at it. It has Whiskey, and drunken raisins AND CHOCOLATE. It is even drenched in a rich, buttery whiskey sauce because more whiskey is always a good thing when it comes to Irish bread pudding. Right? I blame the homemade Challah bread I had sitting on the counter getting stale. Why anyone would have leftovers of this delicious loaf of bread, I can not really explain. I intended to be good. 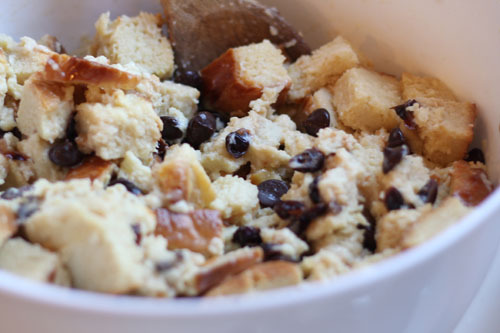 I scanned Cooking Light’s website for bread pudding since I wanted to make a lighter, more angelic version of this typically devilish dessert which is often loaded with numerous eggs and loads of cream. And it all started out rather innocently…afterall this recipe uses a scant two eggs, some 1% and low-fat evaporated milk…and it received five solid stars from its reviews so we were certainly off to a promising start. Then I just went for it and tossed aside the light sauce I originally intended to make, and I made a richer but tried and true whiskey sauce; one that has a quarter cup of butter, a good dose of sugar, and yes, of course some whiskey. Finally, I served it with a dollop of whipped cream. I went to He!! in a handbasket I’d say and yes, I had very good intentions along the way. But I have to admit that it was well worth it. 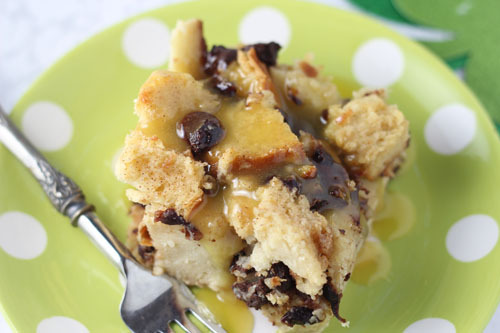 This Irish Bread pudding was delectable, addicting and super EASY to make. My husband couldn’t stop going in for another spoon full and mentioned this bread pudding the rest of the night and he is NOT an easy sell. We polished off the ENTIRE casserole dish in two days. Yikes! This recipe will definitely make it into my, “Must Make For Company” list of desserts along with my othersemi–famous bread puddings, Pumpkin Bread Pudding and my Lemon Blueberry Bread Pudding, both of which shouldn’t be missed. Ah well, I guess it’s about time I sowed some wild oats. One can’t be boring all the time. 1 (12-ounce) French bread baguette, cut into 1-inch-thick slices, or a 12 oz loaf of Challah bread, or in my case I used 3/4 of a large loaf of Challah bread and a couple of left over French rolls cut in 1-inch thick slices (any leftover bread will work here, even hamburger buns or bagels…you just want about 8 cups of bread cubes). The amount of bread in bread pudding is always about one large loaf, but it doesn’t matter if you have a little less or more, it’s very forgiving. See my Pumpkin Bread pudding recipe for ideas of using any old bread, rolls or buns you have that are lying around. Whiskey Sauce recipe and instructions below. 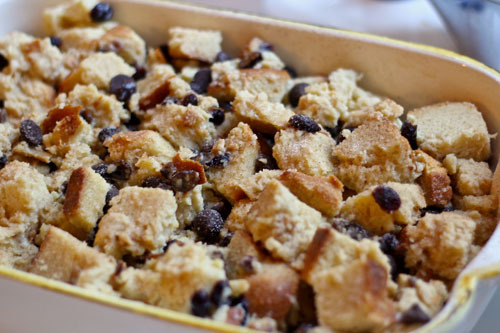 To make the Bread Pudding: Soak the raisins in a small bowl with the whiskey. Preheat your oven to 350 degrees Fahrenheit. Slice the bread into 1 inch thick slices. Spread each slice with the 1/4 c. of melted butter. Place them on a baking sheet, butter side up and bake for 10 minutes. Cut into 1 inch cubes. Beat the milks, sugar, vanilla and eggs together in a large bowl with a wire whisk. Stir the bread cubes gently into the milk mixture. 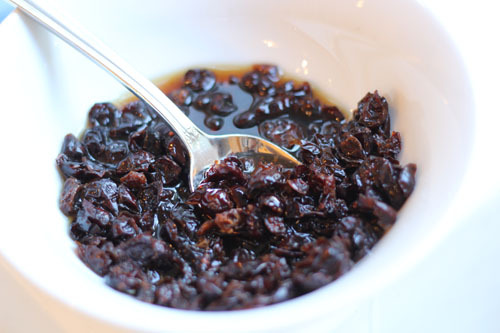 Stir in the raisins with the whiskey (don’t drain the whiskey out!) and chocolate chips into the bread cube and milk mixture. Always stir gently so you are not breaking up the soaking bread. Spray a 9×13 glass dish or similar sized casserole dish (5 quart) with nonstick cooking spray. Gently pour the bread cube mixture into the dish. Mix the sugar and cinnamon together in a small bowl and sprinkle evenly over the top. Bake, uncovered for 30 minutes. While the bread pudding is baking, make the Whiskey Sauce so it is ready and warm when your bread pudding is done. 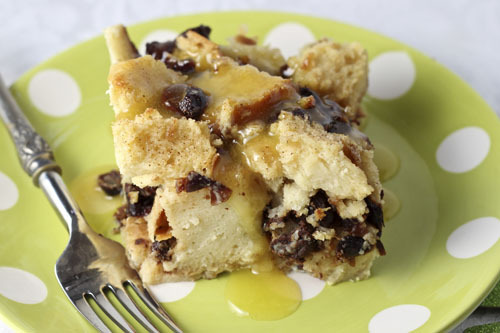 Serve the bread pudding warm with sauce spooned over the top and a bit of whipped cream. To Make the whiskey sauce: In a small saucepan melt the butter. Stir in the sugar, egg yolk, water and whiskey. Cook and stir constantly over medium-low heat for 5 to 6 minutes or till sugar dissolves and mixture boils. Remove from heat and serve warm over the bread pudding, topping with a dollop of whipped cream.